Opening for the season June 2019, see you there! 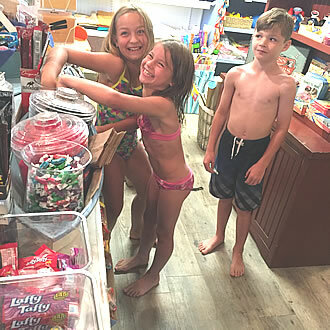 The Veranda Beach General Store offers everything from penny candy to cottage décor and gift ideas. Craving a sweet treat? Forgot something? Looking for something special to prepare for happy hour? The Veranda Beach General Store will likely have it for you! Check out our selection of ingredients and fresh seasonal vegetables and fruits. Our staff can even point you to the Veranda Beach community herb garden so you can clip some fresh basil or cilantro. Feel like decorating your cottage, need a last minute gift idea, or just feel like shopping? The Veranda Beach General Store is a new store every day, offering embroidered apparel, retro games, books and cottage décor! General Store hours: Daily from 10am-8pm.